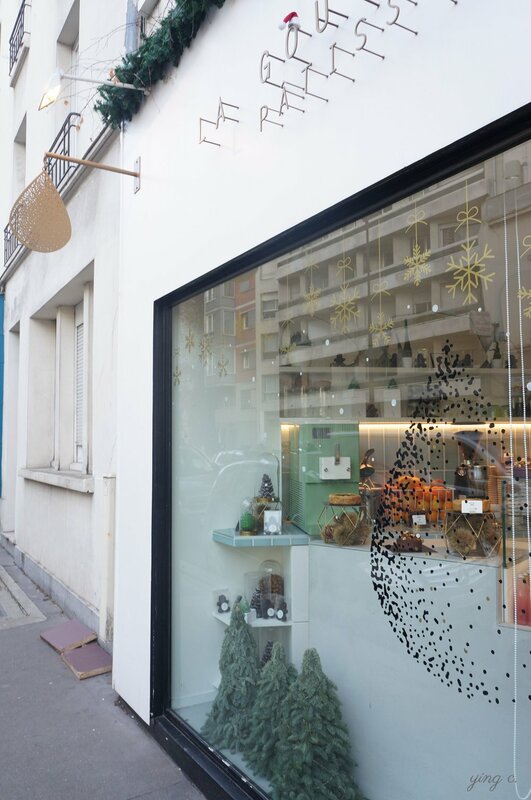 [Paris pastry shop] Pâtisserie La Goutte d'Or (English) — ying c.
Since Montmartre is not my neighbourhood and I'm not particularly attracted to it, I hardly set my foot there and hence hardly have chance visiting the pastry shops, cafés, etc. there. The early morning visit this time was especially made for tasting the chef Yann Menguy's pastries, and apparently it's worth it. Which one to choose? Can you make up your mind? Look at that beautiful Mont-Blanc revisité! While we were having difficulty to decide, here came the chef’s latest creation “tarte mangue-jamsin” (Mango Jasmine tart). We've picked 3 pastries including the Chou fève de cacao (Cocoa nibs cream puff), Saint-Honoré framboise coing rose (Raspberry-quince-rose Saint-Honoré), and the Tarte mange-jasmin (Mango-Jamine tart). I liked three of them as they were really delicate both the presentation and the taste. Everything was in a sweet harmony. The style of the chef is actually quite close to that of Michalak, being very neat, simple yet modern and elegant while less boyish. What we’ve picked in the end - “Chou fève de cacao” (cocoa nibs cream puff). “Saint-Honoré framboise coing rose” (Raspberry quince rose Saint-Honoré). It was a very pleasant experience as the atmosphere of the shop is very cozy as well, and I don't mind visiting it often if I lived nearby. I think we can expect some more interesting creations to come along as this young and talented pastry chef develops his own brand with a vivid personality.